How much life have we left unlived because of fear? This morning I ran into a man I know at the YMCA. His name is Charlie, we met when he visited my church a few months ago. He looks like a pretty typical young millennial guy – he’s got a trim physique, a bit of facial hair, some slim fitting clothes. He also carries a walking cane because he is totally blind. You can imagine the feeling when I saw him coming up the stairs into the weight room at the Y. He strolled right up those stairs, across the running track and through a maze of machines, benches, weights and weight-lifters. Just like it was the easiest thing in the world. I walked over to say hi and he casually asked if I could point him to the 55 dumbbells and an open bench. How does someone develop that kind of courage? I’ve been thinking about fortitude. About fear and risk. A few weeks ago I heard a seminar illustration about an old practice of map-making. In the age of explorers a globe marked an uncharted territory with these words: hic sunt dracones. Here be dragons. It was a spin on the ancient map-making practice of using lions (lions abound here!) and other frightening beasts to symbolically mark the threat of unknown dangers. 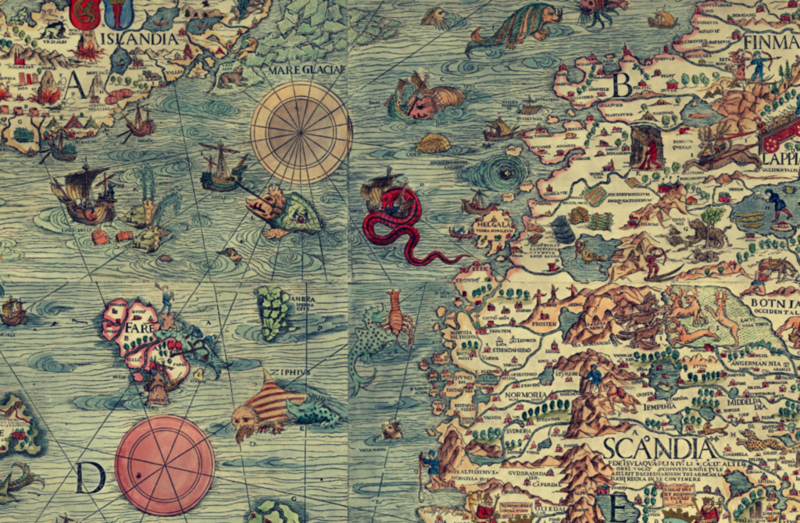 A traveler who read the map would be warned – you don’t want to go there. When I heard the dragon talk I instantly recognized a modern parallel. The old warning is recreated countless times, in sterile offices around the world when expecting parents are shown their version of the map – the one with an ugly dragon drawn over the word ‘disability’. You probably don’t want to go there – there are dragons. You’ll lose your life, the burden of risk is too great! It’s one of the deepest, darkest fears in the heart of a potential parent – a child with broken genes. It’s one of the worst things you can imagine happening to you in life, a place at the edge of the map where no one wants to go. Mandy and I first saw the map during our 4th pregnancy. A few months in, preliminary tests came back positive for a risk of Down syndrome. It was a shock to say the least. A real jolt to the nervous system. Neither of us had any experience with the disability, we just knew about the dragon on the map. You don’t want to go there. You don’t have to go there, they told us. We scheduled an appointment with an ultrasound technician who reassured us that everything was normal. False alarm. Whew. Wipe the brows and sail away from dragon-land as quickly as possible – back towards comfort and security. Just as soon as we escaped, a gusting wind caught our sails and blew us right back crashing into the shore. Right into the delivery room and the arrival of our little girl with her slanting, almond eyes. What now? What dangers are lurking here to bring certain death? In time we recovered from the crash and ventured in-land. Maybe we can find others who have landed here. We made some friends who helped us get acquainted with our new home, we found a few pieces of travel literature and felt our way forward. It was difficult. There were burdens. That is certain. But even in those first days we were surprised by the things they, those map makers, did not tell us about. We were surprised to discover how much love we felt for our little burden. Is it really possible to feel this much emotion? We were surprised by the immediate and overwhelming acceptance she was surrounded with by friends and family and people we hadn’t heard from in years. Can people really be this kind, this good? We were surprised by the adamantine resolve we felt emerging within our chests. Where did this strength come from? 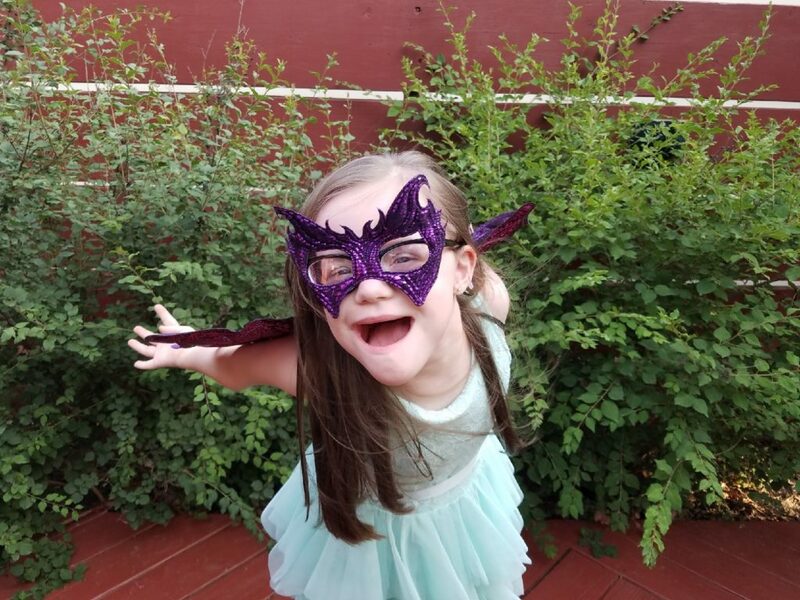 Most of all, we were surprised by the inexplicable little joys we encountered on a daily basis as our daughter’s delightful, unpredictable, thoroughly unique personality began to emerge. She is captivating. This is the dragon-land? This is the terrible, horrendous land of beasts and certain death? Sure there’s some rough terrain here, but there’s some incredible scenery you can’t find anywhere else. A person could live here. We learned quickly that we had to start from scratch. The old rules of navigation no longer work here. The compass lines of comfort, safety and care-free independence give no bearings. Here direction is determined by necessity and love. It’s not about “what will make me happy and comfortable?” but, “what does my child need?” What does love require? You have to grow up here. It’s no longer a question of what-might-happen, but it has happened and what the hell are we going to do with it? It’s thin air to breathe, for sure, but the lungs adapt and the chests expand. Something happens to you when you get thrown into a place like this. Before you know it, fear gradually transforms, transmogrified into resignation, then strength, and finally a determination to make the most of what’s around you and get to living. To start loving and giving your life away. That’s the thing about Charlie. When you’re blind, every place is a bit of an unknown. Every trip is filled with risk (I stepped in at one perilous moment to narrowly save his shins from a gnarly curl bench.) When you’re blind everything is harder and more costly. It’s just life. And you can either stay home on the couch or you can get up and dare the journey and live your life. This is one of the gifts our atypical kids come bearing. They bestow the blessing of facing down the unfamiliar, the terrifying, the this-looks-like-it-could-kill-me and living to tell the tale. They come with keys to unlock the life-sapping shackles of what-might-happen anxiety. There is a kind of courage and inner strength that can only come through experiences like we’ve had. I stumbled into a territory renowned for its hazards and I survived. I adapted and grew and even learned to thrive. I found other intrepid jungle voyagers and together we are gaining strength, making a way, making our own maps. Here is what I have learned in this place. This is my report. There are dragons. There are lions. But we are the dragons and lions. We are the ones who develop thick-as-scales-skin and muscle-lined wings. We are the ones achieving the powers of flight, who challenge the winds and rise through the obstacles and difficulties to soar at great heights with grand, sweeping vistas. We are the ones sitting on shining treasure stores of joy we have mined from out of the hard earth. We are the kings and queens of this untamed jungle, the undaunted ones who have confronted the threatening void of the unknown and no longer fear the darkness. Do you think a woman who has potty trained a child with Down syndrome is afraid of anything? The storms have cast us into this unexplored territory and we have survived to send the report – it’s wild in here. It’s difficult, demanding, sometimes harsh and punishing. But it’s good. There’s life here for the brave ones. There’s life to be had that cannot be found in the mainstream. But to live here, you’ll be changed. To Charlie and all my friends carving out a life in this place, let me speak this word to you – you are lions. You are heroes. You may not feel that way sometimes, but to survive in this place requires heroic levels of love and persistence and courage. It requires heroes. To those newly arrived on our shores, who are disoriented and never wanted to be here: forget what you’ve seen on the maps, don’t let others define your child or your life for you. Gather your courage and come fly with us. You’re about to find out what you are made of. Things are changing in 2018. Our land is no longer defined by the inaccurate and threatening drawings of timid and unknowing map-makers. We are telling our own stories. We are making our own symbols. We are exporting to the world the riches of our land. Yes here be dragons. And lions abound. Welcome to our jungle.